Affordable luxury accommodation in Nata. 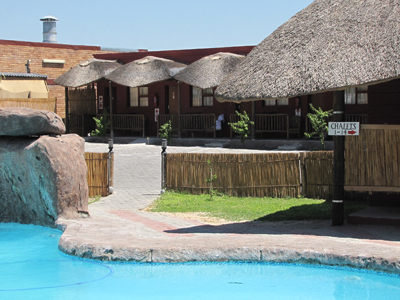 Northgate Lodge is situated in a picturesque setting among Llala Palms in Nata, Botswana. Ideal as a stopover on the way to the Okavango Delta, Maun or Chobe Game Reserve, or as a destination of its own – Northgate Lodge in Nata, Botswana, offers something for everybody. The cuisine at Northgate Lodge in Nata, Botswana, offers gourmet European-style meals, or for the more adventurous, excellent African traditional fare. 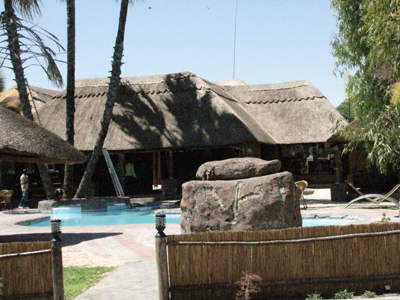 The bar is stocked with every imaginable drink and the swimming pool is a welcome oasis on a hot Botswana day. 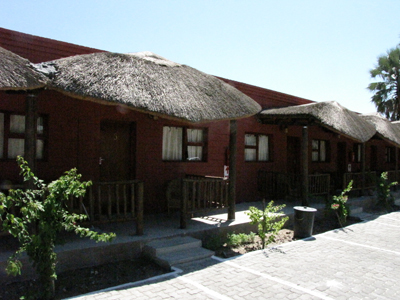 Northgate Lodge in Nata, Botswana, accommodates their guests in three types of accommodation: chalets, executive rooms and family rooms. The chalets are equipped with en suite bathroom with shower, single beds, television, tea/coffee-making facility, mosquito net and ceiling fan. 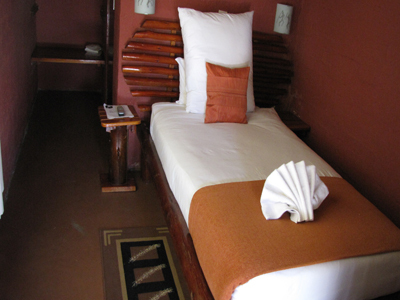 The executive rooms at Nata Lodge in Nata, Botswana, are equipped with en suite bathroom with shower or bath, two single beds or a double bed, television, tea/coffee-making facility, mosquito net and ceiling fan. 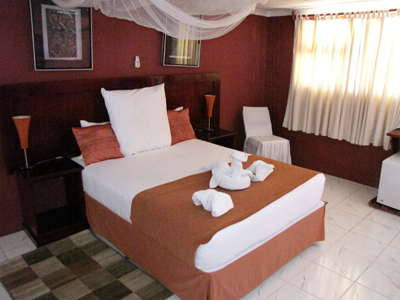 The family rooms (each with two bedrooms) are equipped with en suite bathroom with shower or bath, a double bed, two single beds, television, tea/coffee-making facility, mosquito net and air-conditioner. Prepare yourself for an adventurous holiday when you book with Northgate Lodge in Nata, Botswana. Visit the nearby Makgadikgadi Pans – vast salt pans left over from a huge inland ocean, and be sure to include the eerie Kubu Island and the fossilised dune. More must-sees in the area surrounding the Northgate Lodge in Nata are two famous baobab trees: Chapman’s Baobab and Green’s Baobab. These huge trees were landmarks in the era of the famous traders and explorers. Of course, Nata is famous for the Nata Bird Sanctuary and a stay at Northgate Lodge will not be complete without a visit to this special place. The sanctuary was established in the early 1990s and is a local community project. The sanctuary is managed by a board of trustees from the four nearby villages. Also try to visit one of the villages, where you can taste traditional Magunya and ride in a donkey cart.Prepare yourself for an adventurous holiday when you book with Northgate Lodge in Nata, Botswana. 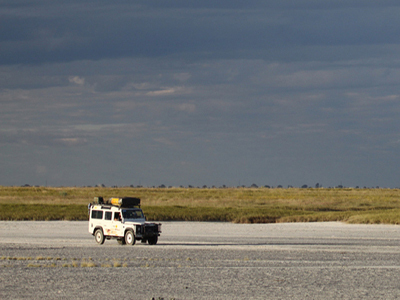 Visit the nearby Makgadikgadi Pans – vast salt pans left over from a huge inland ocean, and be sure to include the eerie Kubu Island and the fossilised dune. More must-sees in the area surrounding the Northgate Lodge in Nata are two famous baobab trees: Chapman’s Baobab and Green’s Baobab. These huge trees were landmarks in the era of the famous traders and explorers. Of course, Nata is famous for the Nata Bird Sanctuary and a stay at Northgate Lodge will not be complete without a visit to this special place. The sanctuary was established in the early 1990s and is a local community project. The sanctuary is managed by a board of trustees from the four nearby villages. Also try to visit one of the villages, where you can taste traditional Magunya and ride in a donkey cart.